Hey, friends! Once again, I'm here to share the contents of my rubbish bin with the internet. I don't know why these are so interesting, but I can't stop reading them and probably won't stop writing them either. In any case, let's get to it! 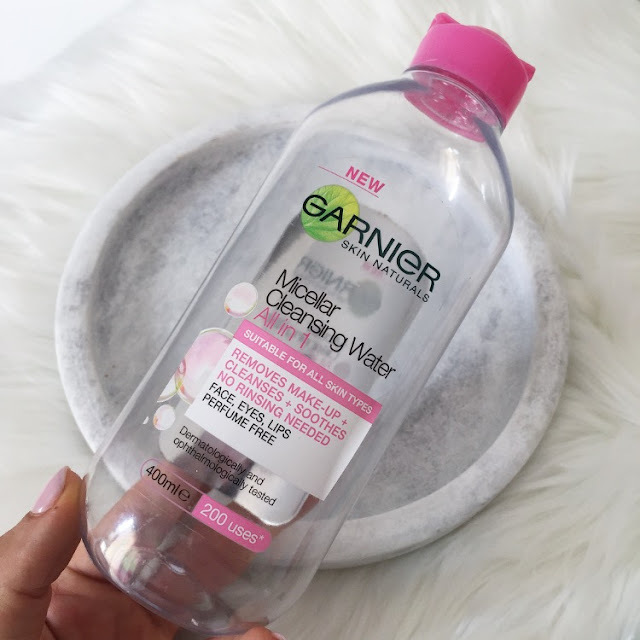 I go through Micellar Water like I go through Diet Coke (at a rate which is probably concerning), and so the fact that I have two of these Garnier babies in my empties box is unsurprising. These are both the original formula, however I have been dabbling in the Pure Active range, which is said to combat breakouts. Scandalous, I know. I will report back on my wicked dalliances soon! Apparently I've been caking it on of late, as there is yet another makeup remover in my pile of used goods. I picked up the Sephora Collection Waterproof Eye Makeup Remover last November, after Jaclyn Hill's glowing recommendation. However, I'm on the fence about this tiny vessel of blue liquid - on the one hand, it removes even the heaviest of makeup without any effort, on the other, it makes my eyes feel like they're on fire. I know, I know, minor details, but I generally enjoy having pain-free retinas, so I there's that. I still used the whole thing, but I probably won't be repurchasing anytime soon. 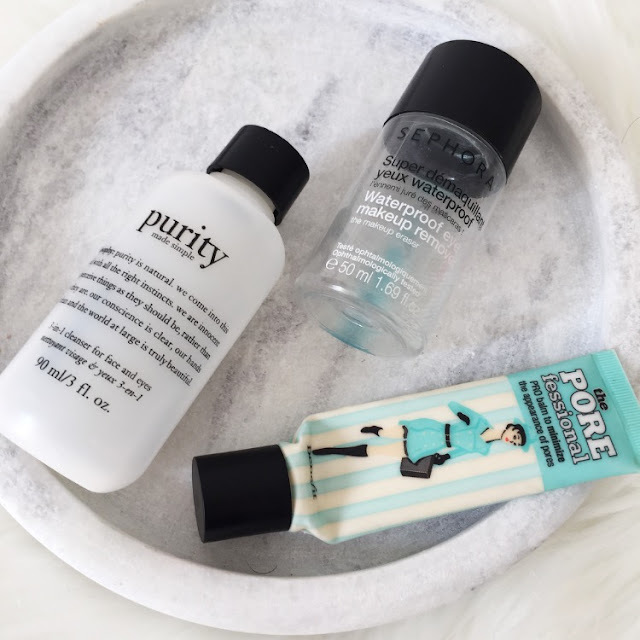 The penultimate skincare item I've emptied is a itty bitty Purity cleanser - an item that was hot on my 'to try' list for quite some time. If you're after a gentle, nourishing cleanser, you'll probably adore this. However, if you're like me, and need some serious acne prevention, you'll want to love this but will have to accept that it won't work for you. Since I enjoyed the feeling of this cleanser so much, I ended up using it in the mornings when I didn't require such a harsh clean, and followed up with stronger stuff in the evening. Rub Rub Rub from Lush Cosmetics has appeared in my empties before, and will probably show up in the future, as its the only body exfoliant that actually works for me. I have Keratosis Pilaris on my upper arms, which is a bit of a pain, but this bad boy helps immensely. Plus using Lush makes me feel great about life, which is always nice. The next item in my pile is also from Lush, although this is less of an empty and more of an 'I didn't use this up before it expired - damn it, Soph'. 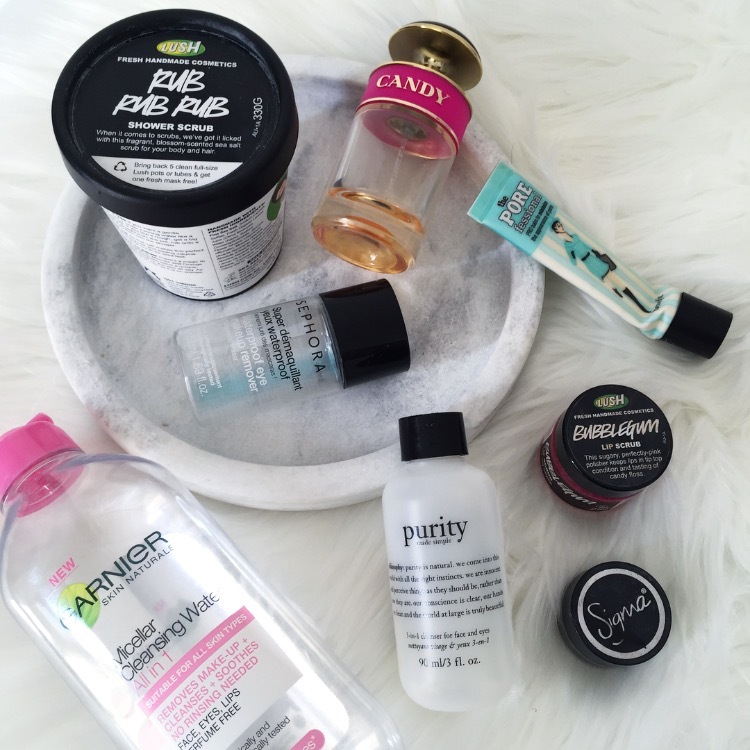 I never seem to get through the Lip Scrubs on time, but they work so well that I continue to buy them any way. Similarly, I did not make it through my entire Sigma Standout Eyes liner in Wicked, but if you follow my Instagram, you'll know I gave this thing a workout. It's jet black, creamy as anything, and makes wings a breeze. I adore it and need 7000 more, thank you so much. Another product I need unlimited back-ups of is the Benefit Porefessional Primer. I talk about this in nearly every blog post but it is truly a gift from the angels, so I'm not sorry. I go through a tube of this every two months, and will continue to do so forever. 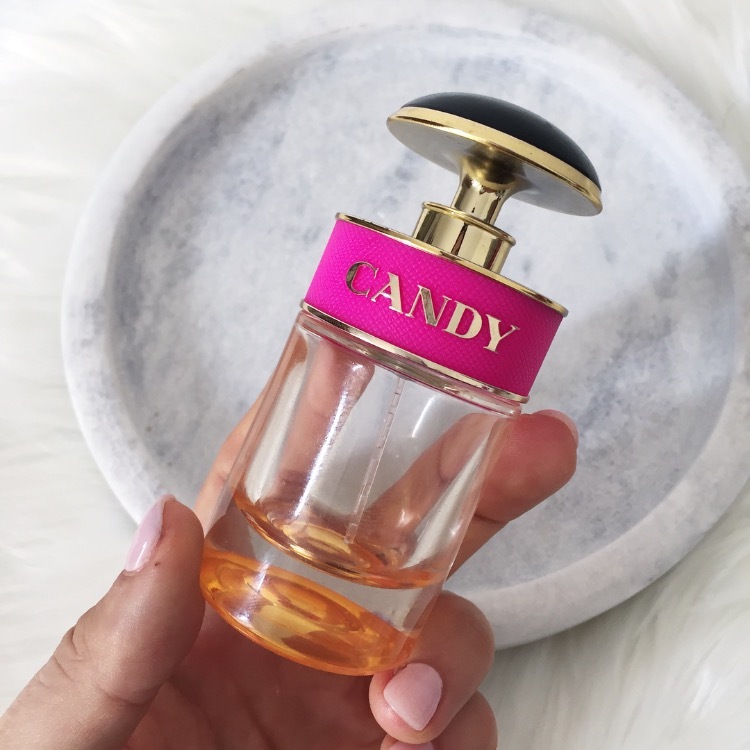 Finally, I polished off my second bottle of Prada Candy, aka my signature scent, aka heaven for the nostrils. This would be a devastating event, however my best friend kindly gifted me a back-up for my birthday, so the world can continue to turn as normal. What have you used up recently? Let me snoop your trash!